Julian Assange - UN Rules in His Favour? Thread: Julian Assange - UN Rules in His Favour? It is a terrible, terrible indictment about the forlorn and hopeless state of the British media that none of them are taking Cameron and Co., to task over their stand on Assange on this issue. The British state's fear of American reprisal is palpable. If the founding fathers of America could appear in today's age and press their cause they would literally be attacked and destroyed by the present day Homeland Security counter-terrorism apparatus as a threat to the current government. Just saw a scary piece on CNN where a Delaware rep was saying Assange was an enemy of the US and should be treated as such and that he put Americans in danger. That same rep also said Trump should be careful criticizing US Intel, like something bad could happen to him. It was scary the way he said it. Last edited by Albert Doyle; 01-06-2017 at 12:37 AM. 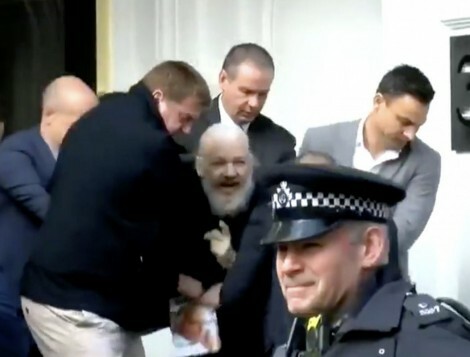 The Swedish Prosecutors have JUST dropped all charges against Assange!....however, British Police say they will still arrest him if he leaves the Embassy!...stay tuned. Westminster Magistrates' Court issued a warrant for the arrest of Julian Assange following him failing to surrender to the court on the 29 June 2012. The Metropolitan Police Service is obliged to execute that warrant should he leave the Embassy. Whilst Mr Assange was wanted on a European Arrest Warrant (EAW) for an extremely serious offence, the MPS response reflected the serious nature of that crime. Now that the situation has changed and the Swedish authorities have discontinued their investigation into that matter, Mr Assange remains wanted for a much less serious offence. The MPS will provide a level of resourcing which is proportionate to that offence. The MPS will not comment further on the operational plan. The priority for the MPS must continue to be arresting those who are currently wanted in the Capital in connection with serious violent or sexual offences for the protection of Londoners. The most relevant literature regarding what happened since September 11, 2001 is George Orwell's "1984". Assange is NOT wanted for any violent nor sexual offences - only not appearing in court [as he sought and received political asylum]. I'd be willing to bet the number of police outside the Embassy will remain the same. The Brits are in on the US's secret plans to get Assange and see him rot in the U.S. Gulag - if not be executed for 'espionage'. The UK stopped the use of the death penalty in 1965. The US has never ended the death penalty for certain crimes, including 'espionage'. On that basis alone, the UK should refuse to extradite Assange to the US, but they have refused to agree to that or to say if they hold a deportation request from the US. The horrible secret entanglements between the UK and US are obscene and are entanglements between each's secret/deep governmental structures. Last edited by Peter Lemkin; 05-19-2017 at 06:50 PM. About three hours ago, Julian Assange was arrested and led out of the Embassy. The Embassy now ruled by a right-wing American client government withdrew his asylum moments before. They had notified the police who were waiting and making sure Assange could not escape. I fear for the worst in the long run. For now he will rot in a U.K. prison...but will soon be extradited to the USA as the head of a terrorist organization. Only Wikileaks unresolved complication with Trump's campaign may in some unknown save him...but I strongly doubt it. He looked very old and frail when arrested and was obviously fighting with all of his might not to be pushed into a waiting police van by about ten police and plainclothes officers. Justice is rarely done anywhere nowadays. This likely will result in his facing the death penalty in the USA without his home country lifting a finger. Shame on all involved.